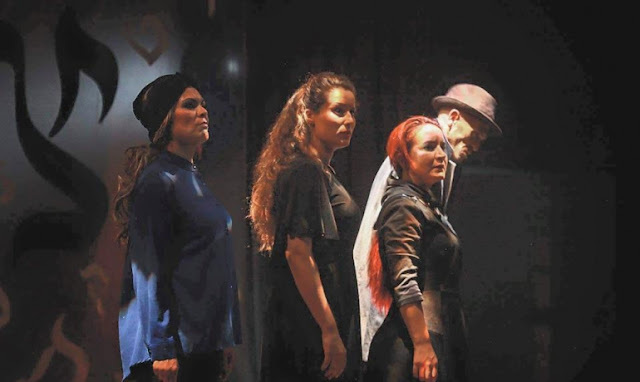 A Mediterranean Theatre festival taking place in Tunisia is featuring what appears to be a thoughtful play on Jewish identity in the Arab world. The piece seems to be titled "Joyev" and it deals with Jews in a fictional Jewish village during the Tunisian revolution. Parts of the plot include a Jewish law student who was expelled from university because of her religion, Jewish families who are too frightened to go out into the streets for fear of the Arab mobs, and a Jew who wants to smuggle out an ancient Torah to preserve it (presumably in Israel) while others want it to go to a Tunisian museum because Jewish heritage is an integral part of Tunisian history. The piece is also predictably anti-Zionist, saying that Israel tries to sow and exploit divisions among Jews in Tunisia to prompt them to make aliyah. But it asks basic questions of how to be a Jew in a country that has treated Jews badly even though they have lived there for years; how Jews grappled with the idea of emigrating to Europe when they were in danger, the Jewish struggle to defend their country of birth when they were marginalized. These are some serious topics and I have never seen them addressed in Arabic arts. The description of the play makes it appear that the director took the subject matter very seriously and it is quite sympathetic to its Jewish characters. The director even took the actors to the Jewish community of Djerba to perfect their accents, as apparently there is a faint accent for the Jews that comes out when they are angry or upset. The director said that this is a subject that has been ignored in Arabic theater until now. Altogether, this seems rather remarkable.